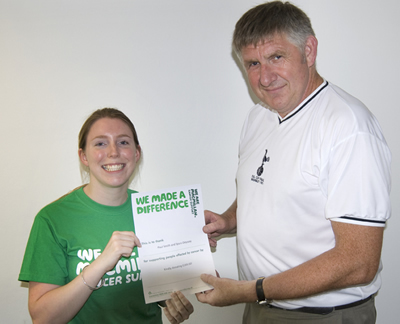 Spurs Odyssey Webmaster Paul Smith (accompanied by friend and photographer Derek Ridgers) went to the head office of Macmillan Cancer Support last Thusday (6th August, 2009) and made a presentation to Rebecca Steadman of Macmillan for the sum of �269 on behalf of Spurs Odyssey members. Donations direct to Macmillan Cancer Support are of course always welcome, and very much needed for this magnificent organisation to maintain the wonderful support they give to those suffering from Cancer, and their loved ones. Just go to the Macmillan home page for more information. Macmillan can be summarised as follows:- "Macmillan Cancer Support improves the lives of people affected by cancer. We are a source of support: providing practical, medical, emotional and financial support. We are a force for change: listening to people affected by cancer and working together for better cancer care. One in three of us will get cancer. 2 million of us are living with it. We are all affected by cancer. We can all help. We are Macmillan." Spurs Odyssey members are already making their pledges for the new season, and no doubt will be supporting a worthy charity or two in the new season!